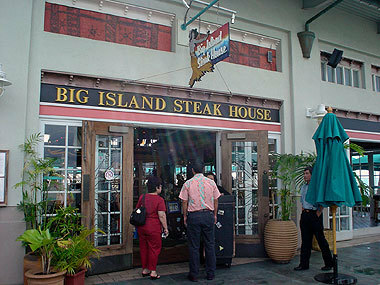 Big Island Steak House has closed. To celebrate an outstanding sales week that our office had in the beginning of December, my manager took a few of us out for lunch at Big Island Steak House. 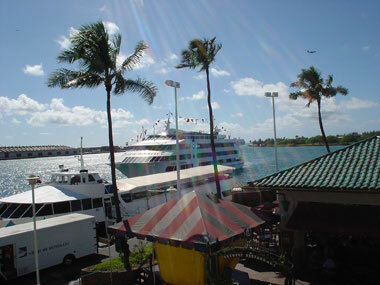 Located at the Aloha Tower Marketplace, it was a 15 minute walk from the office. It was nice and sunny and by the time we got here, I was hot...and hungry. This was my first time here and I was surprised at how interesting the interior of the place was. 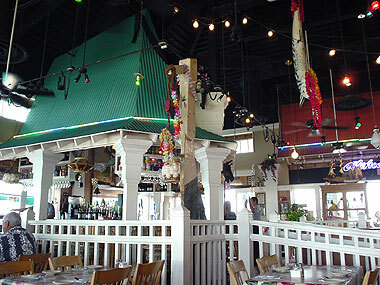 There was a small gazebo-like structure right inside the restaurant. 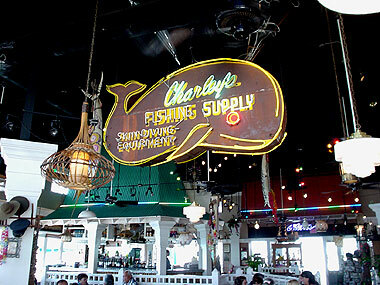 And there were lots of things hanging from the ceiling, including this "whale" from the old Charley's Fishing Supply location. Since I'm trying really hard to stay away from fried foods and because I didn't want to fall asleep at my desk after lunch, I decided to take it easy and have a salad. 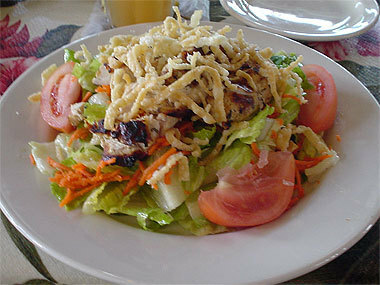 The one that seemed most interesting was the Oriental chicken salad (US$9.95). The salad consisted of a bed of lettuce that had been tossed with some honey-lime dressing and topped with some shredded carrots, some tomato wedges, strips of grilled chicken breast and some slivers of crispy fried won ton skin. To finish, there was supposed to be some Thai peanut sauce on this somewhere. After eating a few bites of this salad, I realized that I didn't taste peanut sauce on it at all. I asked for some additional peanut sauce on the side as was given something that didn't look or taste like peanut sauce at all. I'm not going to insult you by showing you a photo of what I got. The salad dressing was sweet and there was too much of it here. It made the salad soggy. The tomatoes were a bit mushy, with the only saving grace being the chicken. It was nicely grilled with lots of charred bits, which I like. I was a bit disappointed with my lunch. For the money, I expected a salad that would be fresh and full of flavor. Instead, the vegetables were second rate and in my opinion, not worth the money. My friends had the prime rib sandwich (good), the tomato and onion salad (not so good), and the crab sandwich (OK). Judging by our combined experiences, I probably would not come here again. As we were leaving, I managed this last shot. What a gorgeous day it was.